Even more amusing than SUPER SIZE ME - Stephen Holden, The New York Times. CULVER CITY, CALIF. (June 30, 2011) – From boundary-pushing Academy Award® nominee Morgan Spurlock (Best Feature Documentary, Super Size Me, 2005) comes the documentary Pom Wonderful Presents: The Greatest Movie Ever Sold , debuting on Blu-ray and DVD August 23rd from Sony Pictures Home Entertainment. Funny and fresh, the film explores the world of product placement, marketing and advertising and was fully financed by product placement, which has been integrated into the picture. Pom Wonderful Presents: The Greatest Movie Ever Sold will be available on Blu-ray for $35.99 SRP and on DVD for $30.99 SRP. We live in an age where it's tough even to walk down the street without someone trying to sell you something. It's at the point where practically the entire American experience is brought to us by some corporation. Utilizing cutting edge tools of comic exploration and total self exploitation, Spurlock dissects the world of advertising and marketing by using his personal integrity as currency to sell out to the highest bidder. Scathingly funny, subversive, and deceptively smart, The Greatest Movie Ever Sold shines the definitive light on our branded future as Spurlock attempts to create the Iron Man of documentaries, the first ever docbuster! He may very well have succeeded. 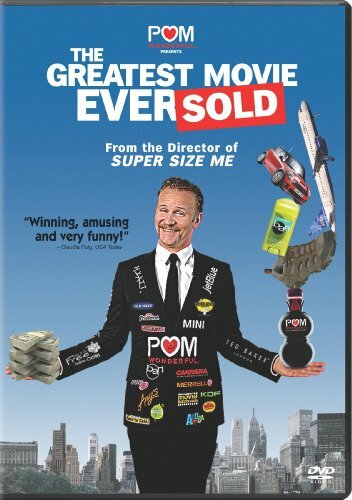 Directed by Morgan Spurlock and written by Spurlock and Jeremy Chilnick, Pom Wonderful Presents: The Greatest Movie Ever Sold was produced by Keith Calder, Jeremy Chilnick, Abbie Hurewitz, Morgan Spurlock and Jessica Wu. Pom Wonderful Presents: The Greatest Movie Ever Sold has a runtime of approximately 88 minutes and is rated PG-13 for some language and sexual material.